Creating an interactive learning environment for students has always been a key strategy for teaching and learning at Etone College and we are constantly on the lookout for innovative ways to inspire our students. Enter the robots! 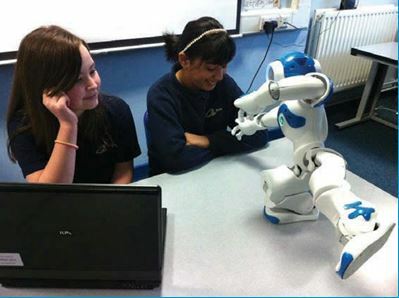 Over the last two years we have been introducing Robotics to our curriculum. This has been supported through a number of initiatives, including the introduction of our LEGO Education Innovation Studio (LEIS). The LEGO Education resources in the LEIS have made a significant contribution to modernising the curriculum and making learning more relevant to our students. The answer is an ambiguous one, but having been given the opportunity to trial the next generation of robotics in education, the future is likely to be in the form of humanoids. NAO is a humanoid that provides a completely different robotic experience; one that amazes both staff and students. I attended a full day training session with a number of other teachers in Warwick. We were introduced to NAO and there was huge excitement. It’s always fantastic to see teachers excited; it is a huge indicator as to what the impact would be in any classroom! The fun and challenging training was delivered by John Pinkney from the Warwickshire ICT Development Service, and was focused on the educational use of NAO. The buzz of learning lasted throughout the day and I could not wait to get NAO into my classroom! 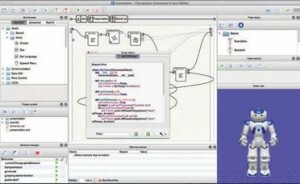 NAO comes with easy to use and flexible programming software – Choregraphe. In its simplest form, it is a drag and drop flowchart style of programming which students find intuitive, whilst more complex programming language can be achieved using C++ or Python. A key benefit of the software is the ability for students to connect to a virtual NAO. The virtual NAO appears on the screen and allows the students to simulate the program before wirelessly uploading to the NAO robot itself. This allows the students to understand the capabilities of NAO and develop their programming skills in a safe and controlled manner. The application of physics, electronics, and mathematical theorems can be drawn out of even the most basic of programs. Indeed, one of the most impressive features of the NAO is its ability to stand up (unassisted) from a horizontal (lying down) position, demonstrating phenomenal balancing capabilities which epitomises the consolidation of Science, Technology, Engineering and Maths (STEM). The Choregraphe software is great at allowing students to develop their problem solving and collaborative skills. NAO also has a range of graded programming exercises that students from which students can develop their programming skills – providing a great foundation from which further extend their learning. NAO offers many opportunities within the new National Curriculum where students are tasked to ‘investigate new and emerging technologies’. The study of the physical robot itself is a great basis to get the students to ‘understand and use the properties of materials and the performance of structural elements to achieve functioning solutions’ and indeed develop their application of ‘computing’ and looking at ‘products that respond to inputs [for example, sensors], and control outputs [for example, actuators], using programmable components [for example, microcontrollers]’. The more that we have used NAO, the more opportunities have come to light – indeed students themselves have actually highlighted many of these through their creative outcomes! NAO obviously generates huge interest across the school and with ‘computing’ now a developing area, he offers much to the ICT department. What a great way of getting students to see the power of programming – it really brings it to life! It also provides teachers a structured way of developing their own programming skills, which for some teachers might be a new experience. The scope of the software certainly meets the needs of ALL users. NAO has also offered much to other areas of the school. During ‘World Book Day’ the students programmed NAO to read a passage from their favourite book whilst making expressive gestures in line with the text. This combination of human likeness reaches out to students who wouldn’t normally be so engaged with literature and demonstrates the wider influence that technology can have on teaching and learning. NAO is so captivating that every student becomes engaged in the learning, which transforms the nature and pace of lessons. 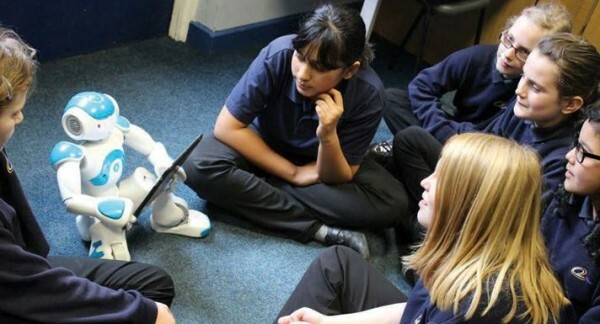 Tasks can be differentiated through the instinctive software, which allows for students to combine more complex multi-task routines such as voice recognition, where NAO actively responds to a programmed verbal command to carry out an activity. Our students were so impressed with the capabilities of NAO that they programmed him to promote the value of robotics within STEM education during assemblies. The audience were not only entertained but also educated on the potential prospects of following a career in robotics. There is no doubt that NAO provides an insight into a technology that many refer to as the ‘technology of tomorrow’. NAO makes a very clear statement that it is in fact the ‘technology of today’, and at Etone we are developing students who can embrace this head-on and take it forward into an exciting and challenging future. “Awesome robot which we were able to continue to use in STEM Club,” Alex. “Fun term with both LEGO and NAO robotics,” Chloe. “Incredible to be able to program a robot to dance to music!” Zahra. “Best humanoid robot yet,” Yusuf. “A fantastic opportunity to work on real 21st century technology,” Karis. “He acts like a real human, I think he’s very clever,” Kira.